We love introducing devotees to new brands and products, especially those that have a strong cult following. In our Cult Classic Beauty Picks boutiques, we've taken the guesswork out of trying new lines by hand-selecting our favorite products in Skincare, Makeup, Fragrance, Hair Care, Bath + Body, and Men's. Right now, we’re obsessed with the Le Couvent des MinimesGood Night Pillow Mist—Lavender & Acacia. Not only is the bottle totally beautiful (and completely worthy of prime real estate on your bedside table), but the scent is also calming. Going into winter, it’s easy to get wrapped up in daily obligations that’ll only feel more demanding with the cold weather and darkening skies (sometimes before you even get off work!). So when you finally get to rest your pretty head on your pillow, you’re craving utter relaxation. Just a few sprays of this mist on your pillow or sheets will fill the room with a subtle lavender scent. It’s made with purifying essential oils of lavender, mandarin, Ravensera, and Tea Tree, which all help produce serotoin—that wonderful chemical your brain releases that helps you feel sleepy. Both your mind and body will feel relaxed, carrying you into a restorative sleep. Who doesn’t need more beauty sleep anyway? Unwinding at night is an important step in not only your beauty routine, but in your health and wellness routine, too. Sleep tight, so you wake up ready to conquer your day. Ready for a great night’s sleep? 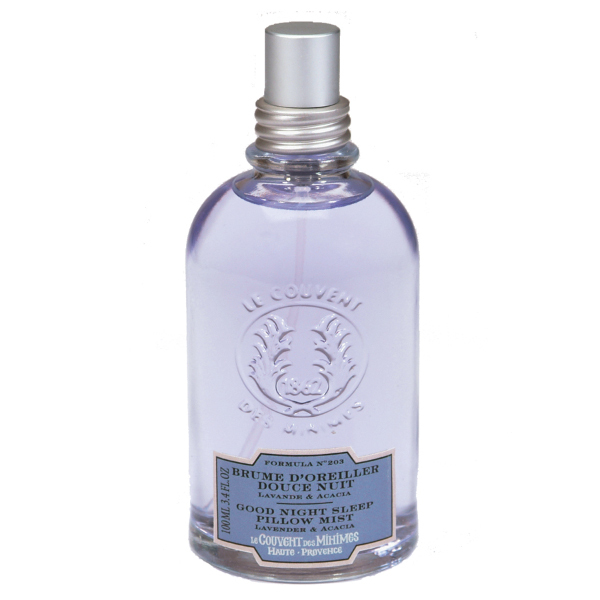 Shop Le Couvent des Minimes Good Night Pillow Mist here. For this and more Cult Classic Beauty Picks, shop our boutiques at b-glowing.com. Editor’s Note: The spray is affordable and luxurious, and most of all, it seriously chills me out on nights that I’m anxious for whatever reason, or having a hard time sleeping due to a busy brain. I don’t know what I ever did without it!